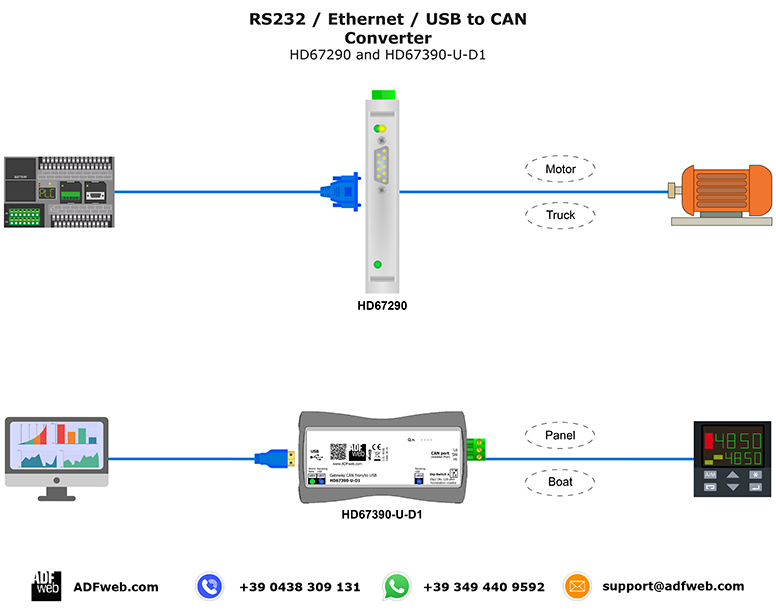 This serie of products allows to integrate a CAN network ( CAN2.0A, CAN2.0B, CANopen, J1939, NMEA2000, DeviceNet ) with a RS232 or Ethernet or USB net. The HD67290 is a CAN / RS232 Converter and it allows you to connect a CAN network with a RS232 network. The HD67390-E-A1 is a CAN / Ethernet Converter and it allows you to connect a CAN network with an Ethernet network. The HD67390-U-D1 is a CAN / USB Converter and it allows you to connect a CAN network with an USB network. To configure the device use our free software, it is very easy. Sono Nicola Tomietto, supporto tecnico di Adfweb. Hai bisogno di aiuto?